A modern day homage to an age old classic? If you have never played Halo before, you probably won't want to buy this game, yet. The reasoning behind this fairly bold statement will become apparent later on, but for now, just take our word for it. This is the first outing of 343 industries, the team that have taken over the Halo mantle from Bungie and will be sailing the good ship Master Chief long after Halo 4, or at least one hopes. 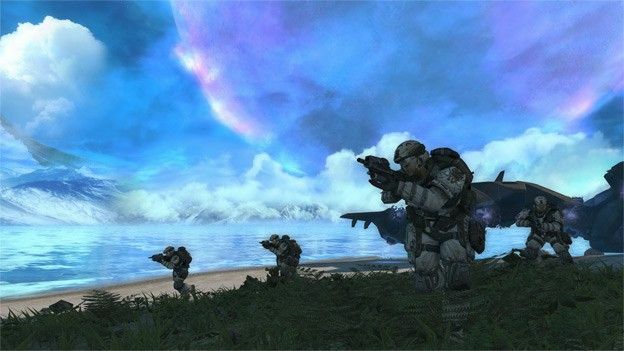 As a way of proving they were up to the task they decided to re-release Halo: Combat Evolved, but with updated graphics, a completely remastered soundtrack and a whole range of new features, but all placed on top of, the original game engine. Has it worked? In a word, yes. Many of the reviews that have given lower scores to Anniversary Edition have cited the fact that they feel it 'hasn't aged well'. This is why they're wrong: when most games are re-released now it's done usually on a mobile format that now has the graphics grunt to play it, it's why you can play classic Atari on your iPhone 4S and more. The only difference here is that you've got the appearance of what 'looks' to be a modern game, in fact at times, it looks as good as titles that are coming out this week. Don't be fooled though, this is still the original, so wonderfully proven when you switch it in real-time between the classic and remastered versions (a feature you will never get bored of). So once you accept that the pistol is outrageously powerful and the controls feel like your commanding a slightly dazed but hideously well-armed bison, then you can truly appreciate it for what it is. The problem is, this only applies to those that have played the game before. For those that haven't, the juxtaposition of the cutting-edge graphics with the archaic engine underneath may prove too much. One way of easily solving this problem is playing the entire game in classic, and then revisit it in remastered, but of course, if you just want a fun modern game to play, then again this may be too much to ask. As if to engrain this point of 'doing it for the fans' 343 Industries have decided to make some additions to the game, luckily not in the form of anything that feels intrusive, but instead by adding Kinect features and a series of ancient terminals which will give fans small hints about the upcoming Halo 4. Looking firstly at the Kinect features, 343 have sensibly gone for restricting the in-game functionality to voice controls with users being able to issue commands such as 'reload' and 'grenade'. It's incredibly enjoyable to use however during the heat of battle, Kinect just wasn't quick enough to respond and so we found ourselves inevitably going back to the controller. That said for other functions the integration was perfect. One of the other key features used by Kinect allows users to scan objects in the remastered Halo environment, letting them discover more about the weapons, aliens and vehicles, this is all accessed through the voice commands of 'analyse' and 'scan'. It's a frankly brilliant feature addition, and is something that truly adds depth to the world you're surrounded by, and while many will call it a gimmick, it is a gimmick, but it's one that works well. The positive aspects of the single player campaign however cannot be shared with the multiplayer sadly. While the original multiplayer was manic, chaotic and bags of fun, games have come a long way, and in terms of longevity, this may not offer the replayability that many gamers are looking for. It's not all bad though, you get several classic Halo map codes included with the game, so if playing it on the original is grinding your gears, then head over to reach and play them on there, overall it ends up being a much more enjoyable experience. Halo: Anniversary Edition is NOT a new game, it's the original but with a completely new layer of icing on top. Because of that, many who are new to the series, or who are not die hard fans may find it jarring as an experience and this is completely justified. For those who have been waiting for this game however it is everything and more. The graphics do indeed breath new life into the original while keeping the classic game underneath means that actually you still end up enjoying all the flaws that Combat Evolved had including the famous indestructible warthog. The inclusion of Kinect was a sound idea and is the first of many more 'adult' titles that will utilise it, and so they should, for aspects such as investigation and basic functions, it's brilliant. To summarise then, this is the game that Halo fans have been waiting for. However to be fair, they've been playing it since it first came out all those years ago, it's just been given a lick of paint, and it looks all the better for it.